← Celebrating Fourth of July…With a park workout! I never count calories now. I haven’t for years. I eat whole natural foods and I know my calorie intake will be where it should be. Really the only time you need to count calories is when you have to worry about calories in vs. calories out. And that only happens when you don’t consume quality calories. So while I’ll make basic notes about to help guide my eating, I don’t that often use a calorie counter or food tracking app. However, there will be periods of time that spur me to be curious about my exact macronutrient breakdown, which is when I turn to a calorie counter/food tracking app. Food logs or food tracking apps/websites are a great way to help you really be conscious about what you are eating. While I think calorie counting is awful and stressful, I think tracking what you are eating can be super helpful. If we aren’t truly aware of what we are consuming, how are we going to know what needs to be changed if we aren’t making progress? If we are succeeding, how are we going to know what works so that we can keep doing it? That is where a food log comes in handy. Anyway, after our Metabolic Typing workshop at Innovative Results, I became interested to see my exact macronutrient breakdowns. I generally don’t worry about exactly what ratios I’m eating. I focus on eating meats and veggies as the base of my diet, with carb cycling throughout the week. My carbs include rice, potatoes, fruit and the occasional corn tortilla. I knew my carbs stayed low, under 60g, on most days and about 150-300g on carb refeeds (with my fat intake under 50g on carb days). But I honestly had no idea what my fat and protein intakes truly were. So I decided to try out a food tracking app. In the past I’ve used Fitday.com. And I like Fit Day, but honestly, it isn’t the easiest thing in the world to use. If you are willing to spend the time to put in your own foods and the nutritional breakdown, it is perfect. I’ve also had clients use Spark People and love it. I found it easy to use and liked that it had some good information in addition to the tracker for anyone using the site. But I decided to try out My Fitness Pal since a ton of my clients love it and I’ve liked using the phone app with them. I’ve only used it with clients and never really sat down and fully used it myself so I was curious to really give it a try. And it is pretty darn great and tracks a ton of stuff. Tracks food and workouts. I do like the “notes” part as well. I customized my own macronutrient ratios and there are a ton of foods listed in the counter already. It is also super easy to save a meal so that you don’t have to go back through and select the list of foods in that meal every time you eat it (which for me is great since I eat a lot of the same meals over and over again). Of course, I was amused by how many different foods there were in there….It is always interesting to see what people consider healthy…Lots of soy milk lattes and sugar-free things….YUCK! There were also a lot more restaurant dishes and processed foods than whole natural ones. Which I guess, at least, allows people to know what they are eating when they eat out. But still, it is sad to see how much of even the diet of people trying to be “healthy” is really processed crap. At least though, people are CONSCIOUS of what they are eating when they track it. Because so many people aren’t conscious of what they eat. And being conscious of what you eat is extremely important. As I said above, if you know what you are consuming, you can figure out what is working and what isn’t. Same thing goes for tracking your workouts. Which is why it is nice that My Fitness Pal allows you to track your goals AND your workouts along with your food. However, while I like the food tracking portion of this app, I can’t say I’m a fan of how the other two sections work. I like that they exist…Just not how they work. Under goals, you can choose macronutrient goals. You can even take a few measurements. You can record how many times a week you want to workout. Which is great. But really the main focus is on weight loss. And it almost even encourages you to weigh every day…Which I don’t like. It shouldn’t allow people to record their daily weight. Because daily fluctuations don’t matter and can even discourage people. Shoot if I weigh right before a carb day and then right after a carb day, I can fluctuate numerous pounds. It’s not really cause I gained weight though! And sometimes I might have even eaten fewer calories than on a low-carb day. And actually the carb days are what help me become even leaner over the long run even if I do gain weight on the scale right after them. The point is…YOUR WEIGHT FLUCTUATES. Be it water weight or whatever else. Weight fluctuates so shouldn’t be tracked daily. And while it has measurements, it only allows you to record neck, waist and hips. Waist and hips are two great places to measure, and tell you a lot, but still…Why not just include arm and thigh as well? You can lose/gain inches on a number places. And all can show progress. So why not include them all? I know that there are only so many things a food/workout tracking app can do, but a couple extra measurements should be included. Just like I think it would be great if the app included a place to record a couple lifts and/or runs and their numbers or times. Right now, the app asks for workout goals that include how many workouts per week, how long and even how many calories you want to burn. And yes, working out the number of times you planned to, and having that be tracked, can be motivating. But performance goals for during your workouts can be even more motivating! Having performance goals can help keep you motivated so that you accomplish other goals, like weight loss goals. Because, let’s face it, when you have a performance goal, you are more likely to eat well AND workout hard no matter how much you want to skip the workout that day. Not everyone who wants to track their food intake cares about losing weight. And if weight loss IS the goal, it never hurts to have other markers of progress to help keep you motivated! I know I just went on a bit of a rant about the goals portion of My Fitness Pal, but really the only thing I HATE about the app, is the workout portion. But worse than that, is the fact that the app puts a HUGE emphasis on cardio. Because when you choose the strength training moves, they don’t show you any calories being burned. Fortunately you can add weight, so if you really wanted to track your lifting progress you could always scroll back through your workouts. However, the only way to show calories being burned during a strength training workout is to select “Circuit Training” under Cardio! I, personally, don’t care if it doesn’t show what I burned during my workout, but since they do add that in to what you should then be consuming, you would think that strength training would have some value. It just made me mad because I felt like it perpetuated the LIE that cardio is key to weight loss (and health in general). Anyway, I’ve found tracking to be very interesting. And I would recommend My Fitness Pal, at least for the food tracking portion. P.S. Another reason I like some of these online/phone apps is that you can easily SHARE and create a community. The more you involve other people in your goals, the more likely you are to accomplish them. ACCOUNTABILITY and SUPPORT! Posted on July 5, 2013, in Diet, program development and tagged fitness goals, food log, food tracker, my fitness pal, workout log. Bookmark the permalink. 2 Comments. 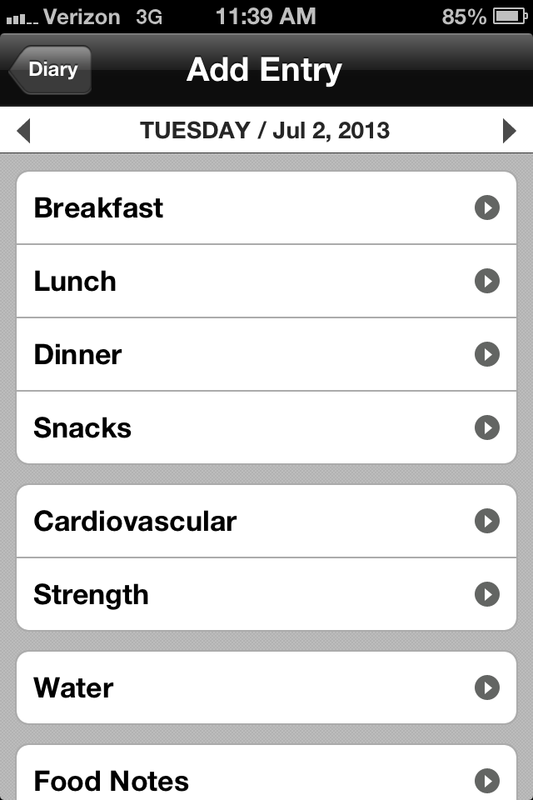 I use myfitnesspal to track food, and Fitocracy for exercise. 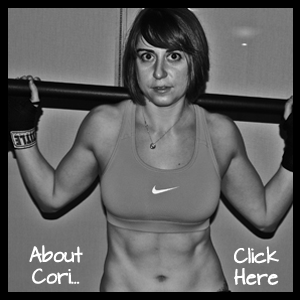 Fitocracy is far more addictive – it is social, and fun to use. As fun as entering data online can be, that is. I’ll have to check out Fitocracy! Thanks M!